Minshew will join WSU's quarterback competition after transferring from East Carolina. HOLLYWOOD, Calif. — The first message Washington State senior receiver Kyle Sweet received this summer from his new quarterback was less a request and more of a command. I’m going to throw tomorrow, Gardner Minshew texted Sweet upon his arrival in Pullman. Meet me on the field. Sweet was happy to comply. Happy, too, to pass along a positive scouting report about the transfer QB from East Carolina. The first thing to jump out about Minshew? “He’s got a cannon,” Sweet said. Beyond arm talent, Minshew has worked hard to acquit himself with his new teammates — and his new receivers in particular — since arriving in Pullman earlier this summer. Washington State announced the arrival of Minshew, a 6-foot-2, 216-pound Mississippi native, in May, after the quarterback flirted with the idea of transferring to Alabama. As a graduate transfer, Minshew will be eligible to play immediately for the Cougars this season, and he will join a competition with Trey Tinsley and Anthony Gordon when fall camp begins next week. Tinsley and Gordon have the advantage of two years’ experience in Mike Leach’s Air Raid offense, but Minshew is the only QB on the roster with FBS experience. Minshew played in 10 games, starting five, at East Carolina last season, throwing for 2,140 yards with 16 touchdowns, seven interceptions and completing 57.2 percent of his passes. “He’s older. 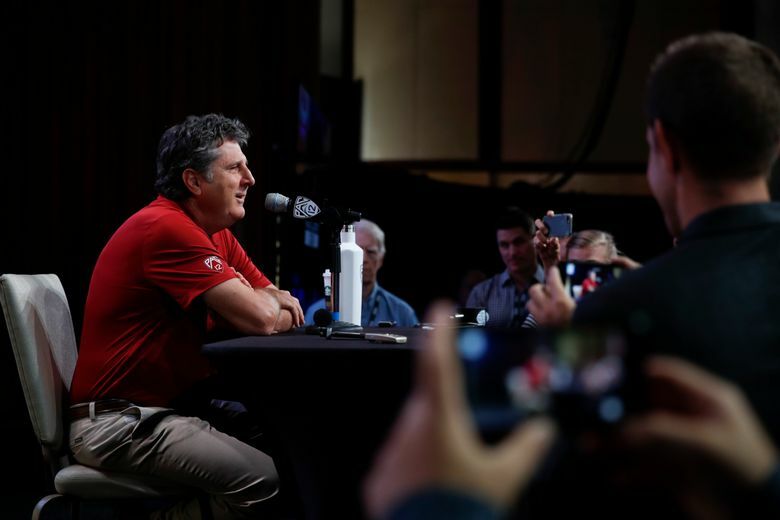 Has some experience in kind of leadership quality, I think,” WSU coach Mike Leach said. “He’s really accurate. Getting acclimated with our players and our schemes, somewhat, but his scheme, he’s been around our scheme some. So there’s that. But it will be a heck of a battle, because I thought Gordon and Tinsley both had really good springs, and I think both of those guys will be difficult to beat out. That the WSU was predicted to finish fifth in the Pac-12 North wasn’t necessarily a surprise to the Cougars on Wednesday. But they do expect to offer some surprises on the field this fall. The Cougars have just 10 returning starters and the least experienced roster in the Pac-12.